Every year it seems like my family gets busier and busier. More sports practices, more after-school activities, more homework, and more friends means very little time spent at home and even less time keeping that home clean. Everyday, the kids would come in, fling their backpacks, coats, and shoes all over the living room and rush off to play. Beds were left unmade, bedrooms declared disaster areas, and everywhere this mom went, it seemed like the toys were breeding. After about a month of living in this chaos, I was D.O.N.E!!! 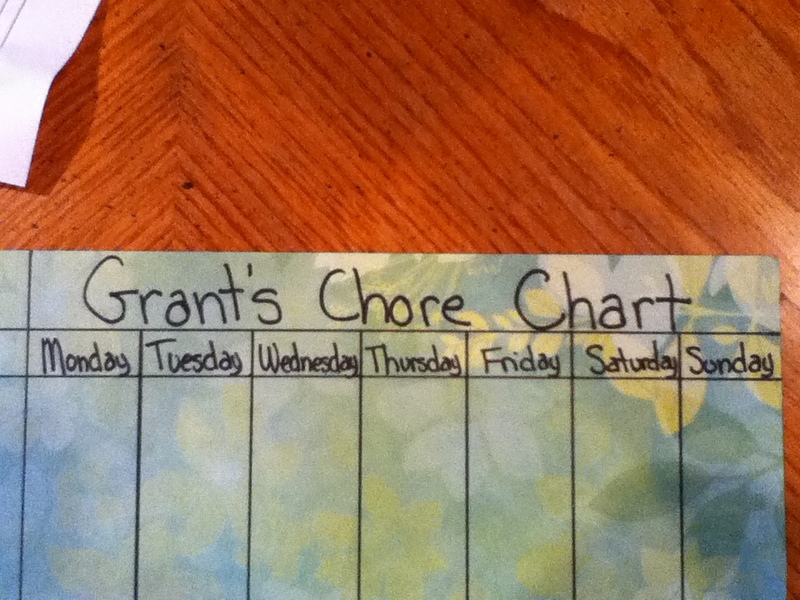 Thus, Chore Charts were made. 1. 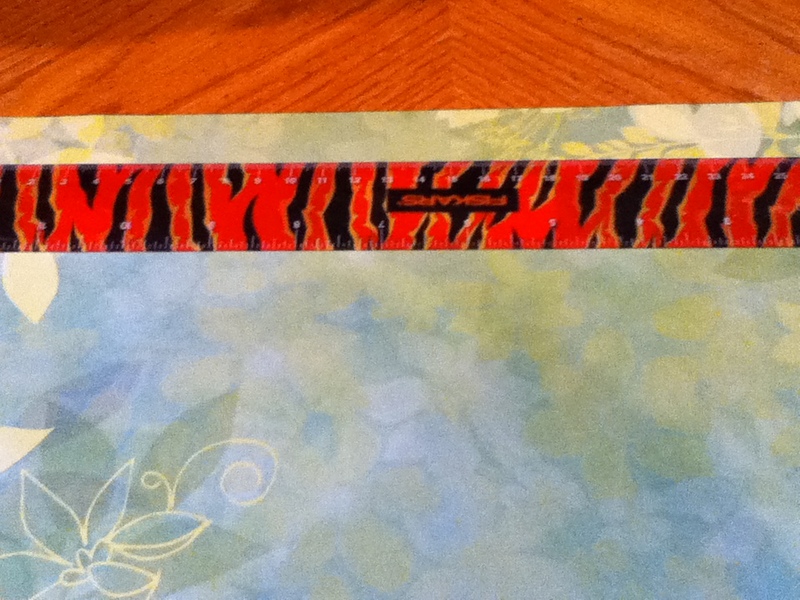 Place your scrapbook paper horizontal. I let the kids pick their favorite. From the top of the paper, use your ruler and mark down 2.5cm and draw a horizontal line. From that line, mark down 1cm and draw another horizontal line. 2. Next, line up your ruler on the first line your drew. From the left hand side of your paper, place the edge of the paper on 21cm. You will then make tally marks every 3cm (18cm, 15cm, 12cm, 9cm, 6cm, 3cm, 0cm). This marks out the spacing of your days of the week. Move down to the bottom of the page and repeat the same tally marks. Next, place your ruler and connect the tally marks, making sure you do not go past the top horizontal line that your created, except the line at the 0cm tally mark (see below). Write the days of the week in blocks and label your chore chart. 3. Turn your paper vertical, with the days of the week turned to the left. Place your ruler on the line closest to the bottom of the page. Line up your ruler at the 0cm make with the line below the days of the week and make tally marks every 3cm (3cm, 6cm, 9cm, 12cm, 15cm). Move you rule to the top of the page and repeat the same tally marks. Next, place your ruler and connect the tally marks the entire length of the paper. 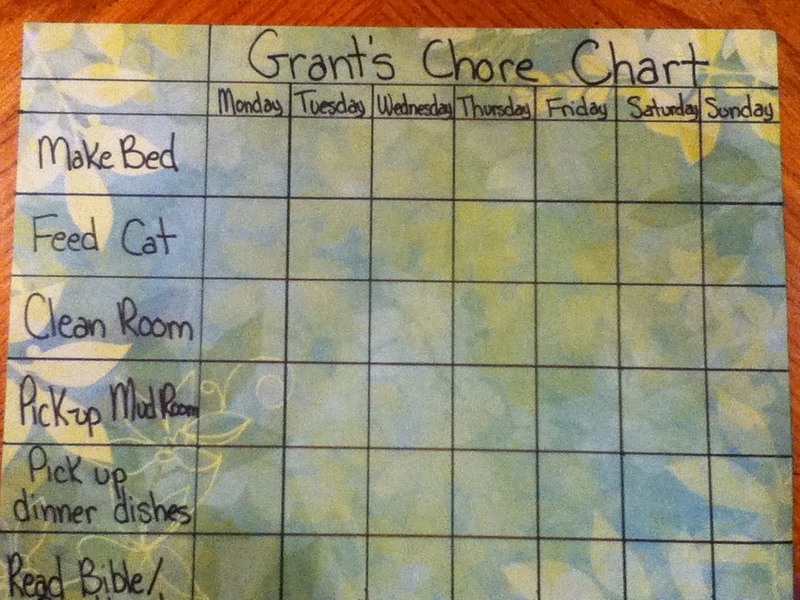 Fill in your child’s chores to the left of your chart. 4. 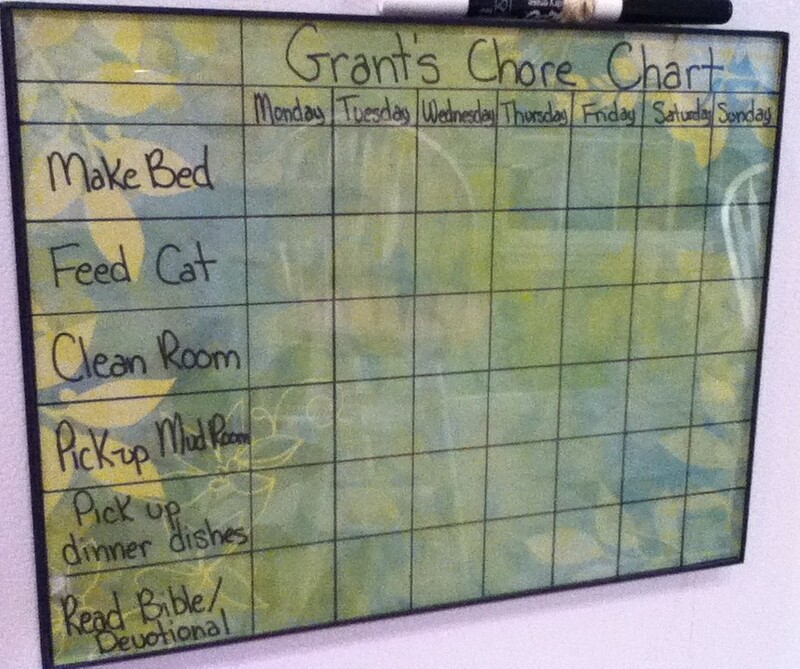 Place your completed chore chart in the document frame. Next, take your round magnets and hot glue them to the four corners on the back of the frame. Take a dry erase marker and place hot glue about 1cm below the cap. You will need to turn the marker and make a complete circle to attach your yarn to. Then take a 12in piece of yarn and carefully wrap the yarn around the marker, covering the glue. Be careful with this step because you can burn yourself and third degree burns are not worth any craft project! 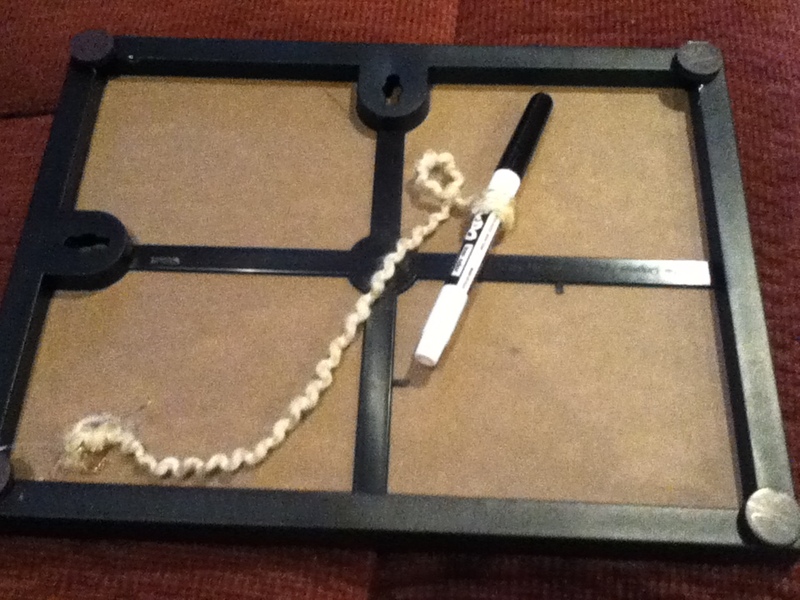 Finally, place a dab of hot glue to the back of the frame and attach the other end of the yarn, attaching your dry erase marker to your chore chart. 5. Now, hang completed chore charts on the fridge and get ready for some fun cleaning times. My kids have really done well with this system. They enjoy marking off each chore they complete, and really enjoy the allowance at the end of the week. I like the fact that I don’t have to fuss at my kids to pick up after themselves. You do have to make rules when setting up this type of chart system. We have it stipulated that if you do not complete a chore, you don’t receive as much allowance. Our youngest was the first to challenge this rule, and he was really annoyed when his big brother got more money than he did one week. Needless to say, there have been very few chores not completed since that lesson. I hope you enjoy creating this chore chart for your little ones and that it helps your busy life flow just a little more smoothly. This week, I continued to slowly work on organizing and redecorating Grant’s room. After successfully reorganizing his closet, I wanted to work on his desk space next. As you can see, my little man is somewhat of a paper junky. He loves to write stories, draw, paint, make math sheets/play school… you name it, he’s creating it. The only problem I have with his creative personality is the huge mess he makes of his desk and room. Papers and books scattered everywhere, markers without lids, dried paint on paint brushes, and a trash can that is never empty. I knew that Grant would need many different cubbies to organize all of his different things. I really didn’t have anything around the house that would work, but at Wal-Mart I found organizers for really cheap in the kitchen section. I ended up getting all the organizers for less than $10. I also thought that he would need some organizers for the top of his desk. I had a few containers that I was going to throw away (coffee can and bread crumb can) that I knew would be perfect. 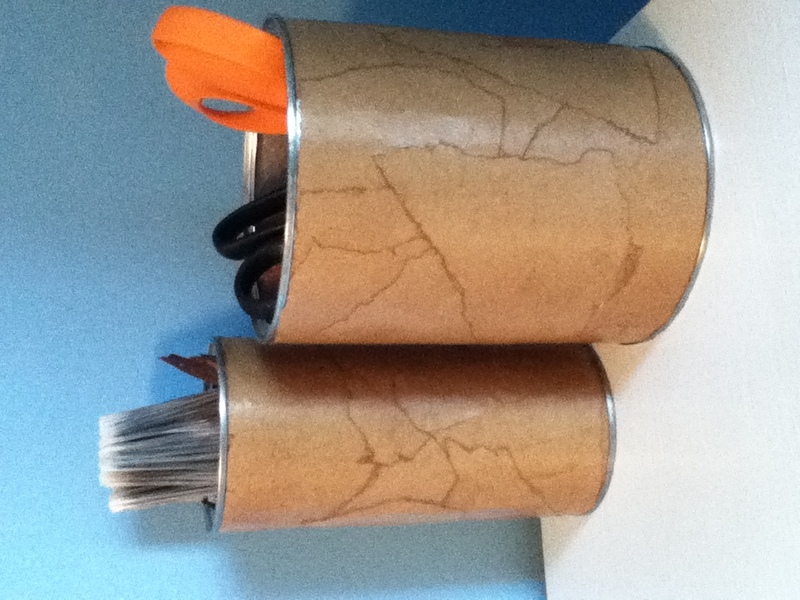 I covered both cans with Mod Podge, tore pieces from a brown paper bag, and glued them on with the Mod Podge. After letting the containers dry, I placed them on his desk and filled them with scissors and paintbrushes. 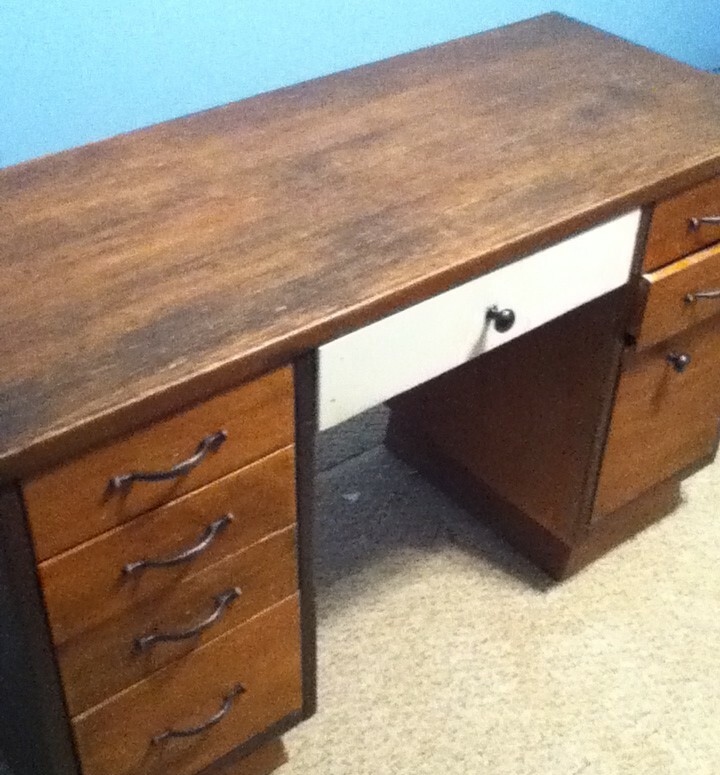 Grant loves his new desk, and I love that it cost me less than $10 to repurpose. It seems that my husband and I tend to make big decisions rather quickly. You’d be shocked at how quickly we decided to move states for his job transfer or the decision to expand our family to three and again to four. Obviously these are two huge decisions that couples normally go through quite a lengthy process of discussion, with careful thought and consideration. Not that we don’t do that but we are usually “go with your gut” type people. I’d like to think that it has been a pretty good strategy for us. As I sit here thinking about the last two years of my life, I’m overcome with such joy and amazement. 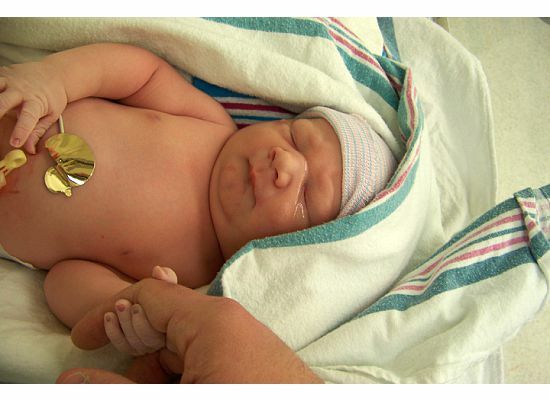 I’ve shed some pregnancy/hormonal tears reviewing the pictures of my sweet boy and the first two years of his life. What a rollercoaster it has been. From a whirlwind delivery to a crazy move to a different state. From a big boy at delivery (9lbs, 7oz) to an even bigger toddler (35lbs). These two years have been amazing. Now instead of making one of those “go with your gut” type decisions, I decided to change my ways when it deals with those picture perfect moments. Maybe I’m still hung up on the fact that I failed to throw a birthday party for my child on his first birthday. He instead got an amazing week (thanks to mother nature and the blizzard of 2011) hanging out at home with just Mom, Dad and Bailey (our dog). So why am I making such a fuss over his second birthday? It all started with the theme. There are just so many things that he’s in to these days. He loves Mick, aka Mickey Mouse and Choo Choo’s (that would be trains in Davis speak) or his longest obsession “The Backyardigans” which our entire family now refers to as “Ba Bo’s”. I had everything in my online cart, almost ready to push BUY on the most adorable Chuggington birthday party when I doubted myself. He has loved The Backyardigans for so long, why am I denying him this joy? So I spent the next few hours finding new sites, checking prices, and ordering supplies for a Backyardigans “dance party”! Now comes the hard part! What to do in the dead of winter with 6 two-year olds. A lovely google search quickly told me that I should only have one friend per year of life. Really? Just two of his friends? That sounds more like a play date than a party. So, from that point on, I knew google would not help me with this one. I also have another thing against me. I’ve never been to a birthday party for a two-year old that was just for kids. I have no idea what happens at these parties or what to do with the 1.5 hours that I have allotted. Ahhhh, I’m stressing myself out even more just typing this! Two year olds are a little too young to understand the concept of games, so musical chairs or any other group activity is out. I finally decided to do a hands-on craft that the kids could take home. Through my obsession with Pinterest I found a great recipe for some homemade playdough and made 6 batches for the kids play with. I also bought glitter (I don’t even want to think about the mess) for them too add to it and make it more fun. I’m going to give them lots of kid friendly tools from the kitchen (cookie cutters, spatulas, spoons, etc) and let them have at it. My son loves playdough and many times ends up eating it as do most kids his age. 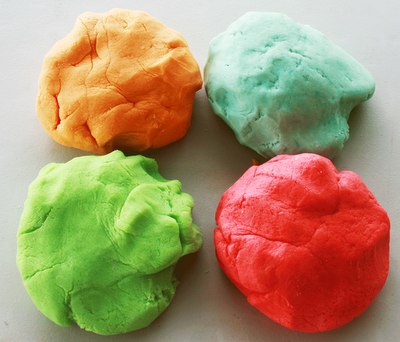 Here is the amazing smelling, edible playdough recipe that is extremely easy to make and much cheaper than store-bought. 1. Mix flour, salt, cream of tartar, Koolaid and water in a medium saucepan. Stir in oil. 2. Mix over medium heat for 4-8 minutes until the mixture forms a ball. If you want a richer color (the yellow, for instance, is weak), add some food coloring until you get your desired color. The dough will start to take on a darker color. 3. Remove from the pan (Caution: the dough will be warm). Place on smooth counter or cutting board. Knead dough until soft. Don’t worry if the dough seems sticky, continue kneading while it cools. 4. Store in air-tight baggies. Additional tips: Feel free to leave out the Koolaid. Divide dough into smaller portions and place in baggies. With your help, add food coloring of your child’s choice to the baggie. Let your child knead the dough and see the colors and swirls appear! I hope that all of the kids enjoy this at my son’s birthday party this weekend and I can’t wait to celebrate one of the most important events in my life. 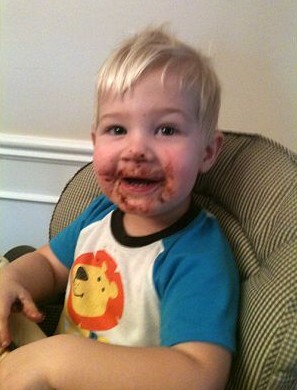 Happy 2nd Birthday Davis!! In my quest to get my house organized, I knew that I would need to start with one of my boy’s rooms. How did I know I needed to start there, you ask? My first clue was the sore foot I got from stepping on a toy car few weeks ago. The second was the constant morning wail, “I can’t find any socks!” when I know for a fact that both of them have socks in their drawers. The final straw was when I finally uncovered the strange smell coming from my son’s closet…a forgotten sandwich shoved under piles of clothes after his last attempt at cleaning. So what did this mama do? After praying a very frustrated prayer for patience (and throwing the sandwich away), I got to work. Knowing I would need a clean slate to start with, I took everything, and I mean everything, out of my oldest son’s closet and piled it on his bed. I don’t have a before picture, but let me tell you, it was really bad. I had willingly allowed my kids to color on and put stickers/pictures on their closet walls (I thought it would curb the urge for them to do this to their room walls). My oldest, a packrat in the making, took this a little further by taking weather striping and making roads on his closet walls (that was fun to remove…trust me). After scraping off the stickers and weather striping, I cleaned the walls with damp rag, also cleaning the baseboards, ceiling, and light fixture. Next, I grabbed a can of white flat latex paint and gave the inside of the closet 2 coats of paint. After about 2 hours of cleaning and prepping, I finally had an empty, clean closet to start organizing. While I was working in Grant’s room, I had decided to get rid of his long dresser and move all his clothes to the closet. This would hopefully make his narrow room seem much larger than it is. With an empty closet and a bed full of clothes, I headed to Target and Lowe’s to explore my closet organization options. At Target I picked up a ClosetMaid 3 Drawer Organizer and Closetmaid Stackable 3 Cube Organizer for about $60.00 and also a few more children’s hangers. I wanted to add more hanging space, so I bought 2 Real Organized Adjustable Closet Rods at Lowe’s for about $8.00 each. First, I assembled the two ClosetMaid Organizers as directed. Next, my loving husband anchored the bottom drawer to the wall. Unfortunately, this took some time, because there were no wall studs where I wanted the shelves (right in the middle of the closet). 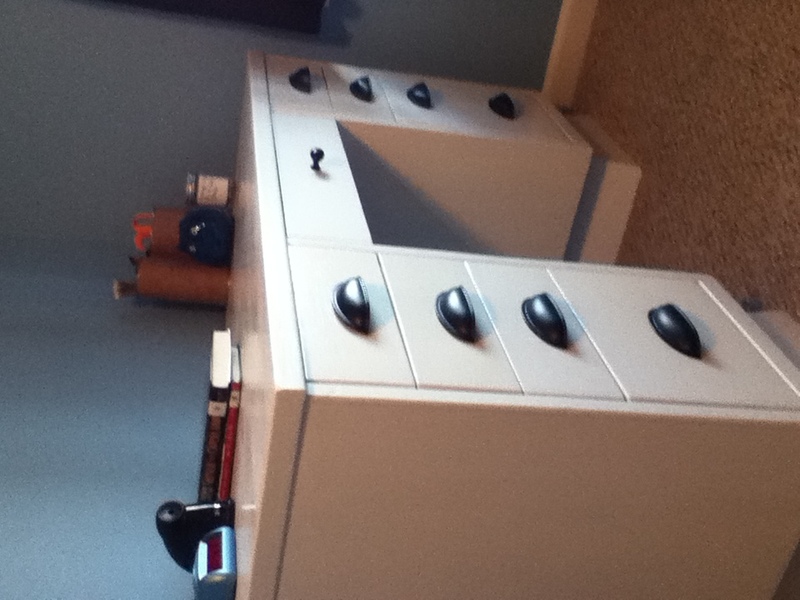 Now, I know many of you are asking, why do you need to secure the drawers into studs? Two words… my boys! I once found my youngest straddling the fireplace mantle and the TV cabinet to retrieve a toy that had been put out of reach as punishment. So trust me when I say, it’s always a smart idea to secure heavy objects, or items that might be used for climbing, to the wall studs. Delete. Get rid of those clothes your child has grown out of, damaged, or they just won’t wear. Make 3 piles, one to keep, one to donate, and one for trash. I also added a fourth pile, clothes that will go to little brother. Be fierce, keep only what you think your child needs. Hang like items together. You can see from Grant’s closet, his shirts are on one side, and his pants are on the another. I also further organized them by season, use, and color. 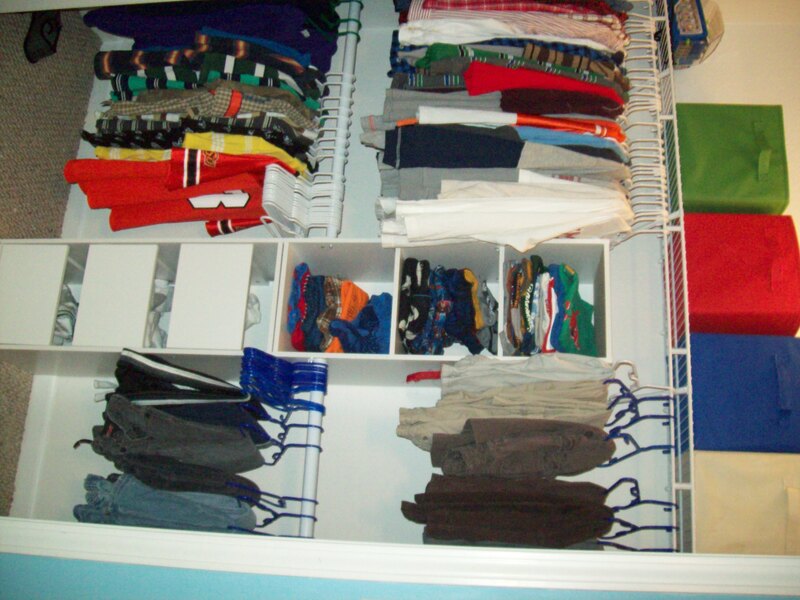 For example, his long-sleeved shirts (shown on top) are organized by function (school shirts, sweaters, dress shirts) and then by color. This has made it easy for him to find his favorite things. With his pants, I placed the more frequently used jeans on the bottom rod and have his dress slacks on the top. Keep it clean. That’s right, the solution to a clean and organized closet is to…..KEEP IT CLEAN! No more clothes on the floor, writing on the walls, smelly sandwiches, or any other closet disasters you might face. Try to encourage your kids to keep their closet clean and organized (and a little 5 minute help from mom every day doesn’t hurt either). Grant’s closet has been like this for a few weeks now, and after a few minor mama/son misunderstandings (like your clothes DO NOT belong on the floor! ), it’s still looks really good. We did add a small laundry hamper to the corner, but other than that, the closet looks the same. This project took most of the day to complete, so if you decide to do a total closet redo like I did, plan accordingly. 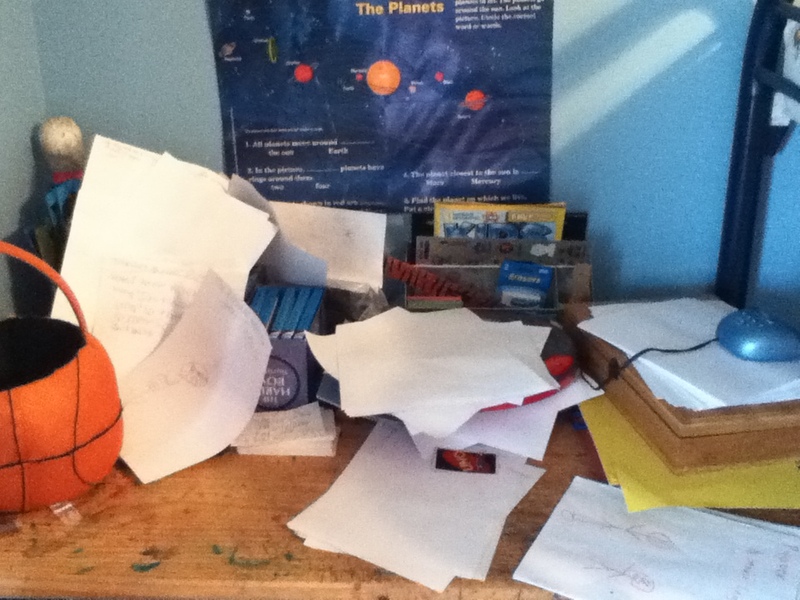 Next week, I plan to show how I got my little packrat’s desk more organized. Let me know if you have any ideas or suggestions. As I’ve mentioned before, we recently moved my son to his “big boy” room. We tried to do this with as little fuss and chaos as possible, but I also wanted to make him a cute room that he would enjoy. As soon as we found out we were pregnant again, I knew that we would need to move Davis to a bigger bed so the crib would be ready for the next little one. I scoured the internet looking for children’s bedding, but hit a huge snag. The bed we have moved Davis into is a queen bed. Do you know how difficult it is to find toddler/children’s bedding for a queen size bed? Well, it’s not easy at all. You’re lucky to find a full/queen set appropriate for a toddler, and then you can never find really, really cute matching sheets (because children only sleep in full, twin or toddler beds…right?). Davis’s bed will serve as an extra guest bed when we have visitors and, for this reason, I want bedding that’s little boy appropriate without being loud and obnoxious. I also wanted to do this as cheaply as possible and for once my procrastination and unwavering ability to never complete a project on time paid off. I found a really cute set at Target (hello 5% discount with your Target Card)! So, I picked it up at the store and since it was on sale (10%…SCORE! 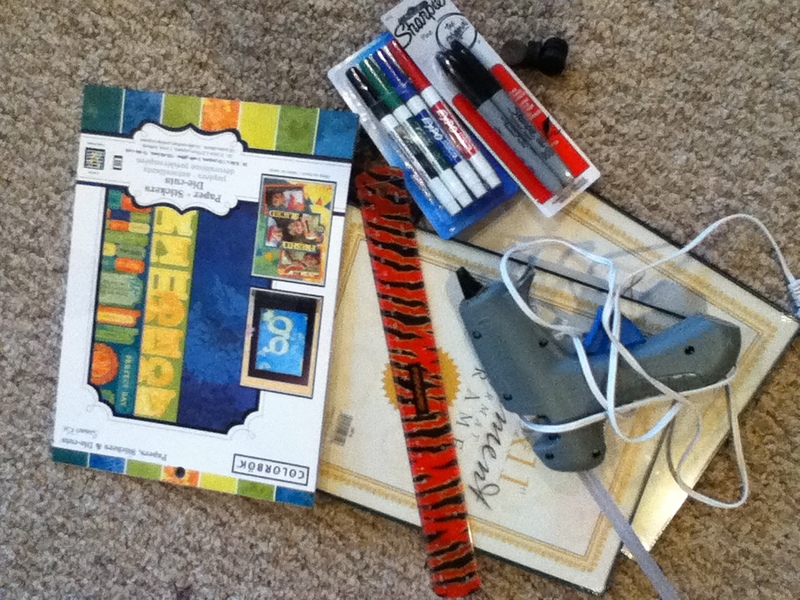 ), I also picked up matching wall decals and other items such as lettering and chalkboard decals. Next came the important paint color and seeing as I’m a paint chemist, this was quite a daunting task. After a couple of weeks, I finally settled on a main wall color along with an accent wall color. It then took me another couple of weeks to muster up enough energy (hello, first trimester!) and get the room painted. Around this time, I was once again perusing through Target and stopped by the bedding department to see if they had anything else that matched what I had already purchased. Much to my surprise, the bedding and all of the accessories I purchased a month before were now on clearance for over 50% off!! See I told you, my procrastination and indecisiveness finally paid off. So, I rushed home, returned what I had bought and repurchased everything (plus a lamp!) and paid half of what I had originally! DOUBLE SCORE! Davis has been in his new room for about 3 months now and he loves it. 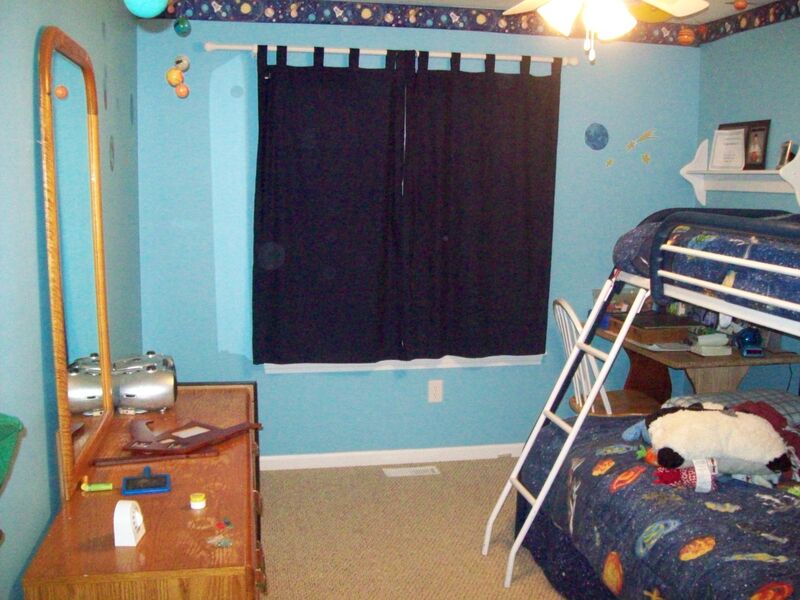 He talks about the cars and trucks on his walls/bedding all the time! The only issue in his room was this huge blank wall. It was the longest, bluest, uninterrupted space in his room and it left me baffled. Also, I kept having a situation with art projects piling up around my house. Davis goes to an amazing daycare center and he comes home almost every day with some sort of drawing or other work of art. I have grand ideas of taking pictures of his art and making books with Shutterfly, but honestly most of his art work resembles big blobs. Don’t get me wrong, they are glorious and pretty much rival Picasso’s’ work, they just don’t photograph well. So, I came up with a solution to both of my problems – a Masterpiece Display! 1: I started by purchasing a simple picture hanging kit at Target. It was ~$1.50. Make sure it includes picture hanging wire and eye hooks. If you want to go for a softer look, you can also use yarn or twine. I chose the wire to maintain the industrial look of the cars and trucks theme. 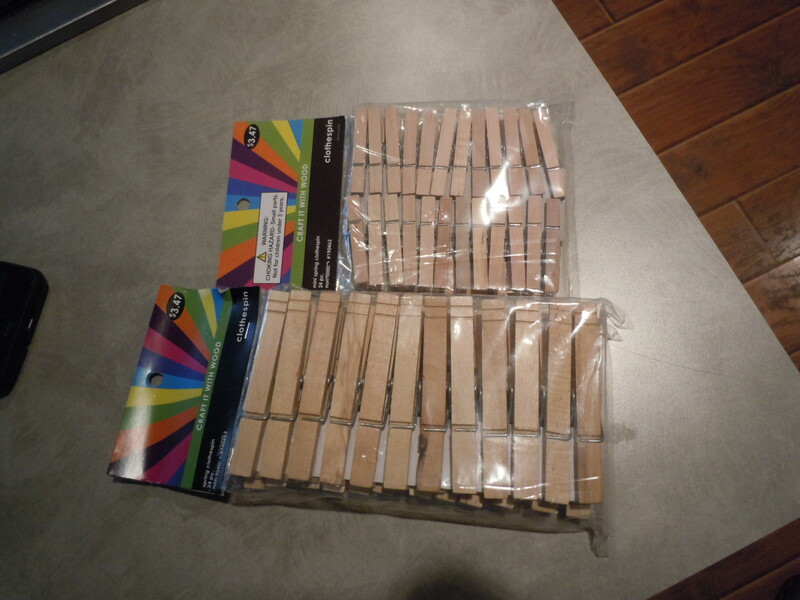 2: I also purchased clothespins in two sizes from Hobby Lobby (they are in the craft wood section). 3: I had already purchased some water-based acrylic paint from hobby lobby to paint some wood shelves for his room so I used that paint to dye the clothespins. 1: I mixed the paint with some water (make enough to completely cover the pins) in a kitchen bowl. 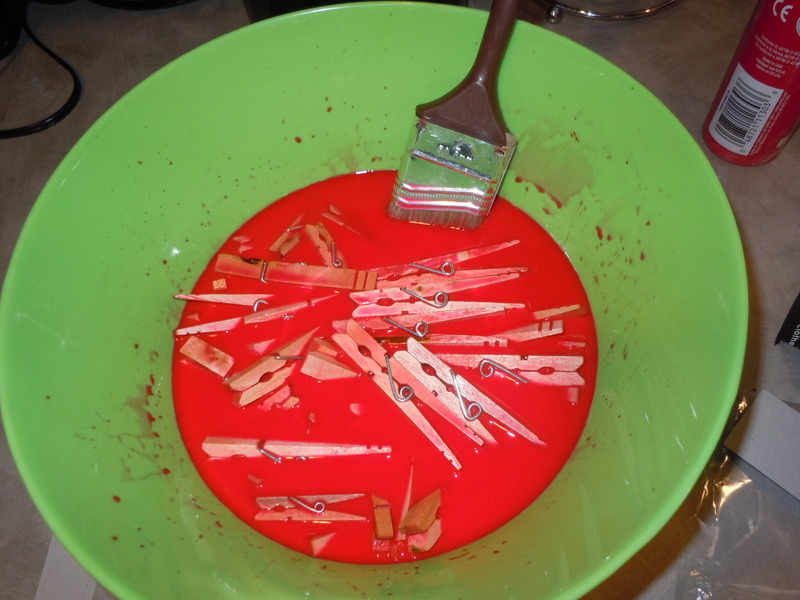 I allowed these to soak for about 8 hours but you can soak them for longer or add more paint to your mixture if you want a stronger color on your clothespins. I then placed the pins on cooling rack to completely dry (overnight). 2: I hung the picture wire using the screw eye hooks, about 12 inches from the ceiling and 1.5 feet from the end of the wall on both sides. A laser level came in very handy when trying to do this. 3: Then, I hung the wire between the two hooks rather tightly (it will bow when you add pictures to it). 4: I also decided to us leftover lettering from my earlier bedding purchase to create a cute header. I chose “My Creations” but other ideas are: “Works of Art”, “Masterpieces”, “Look What I Did” or something similar. 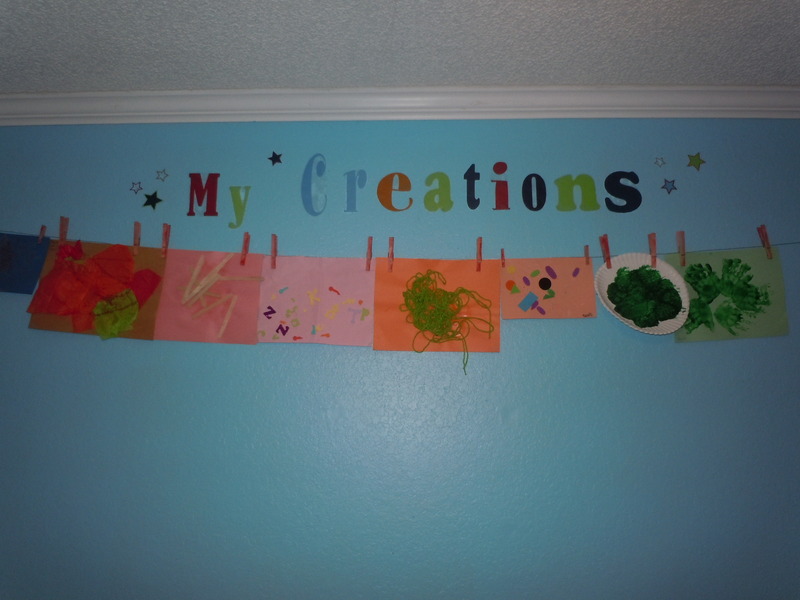 5: Finally, I picked my favorite art pieces and hung them up, securing them with the dyed clothespins. Voila! No more empty wall and a creative, inexpensive way to display my little Picasso’s artwork! Try this in your little artist’s room. They will beam with pride as they show off their works of art!